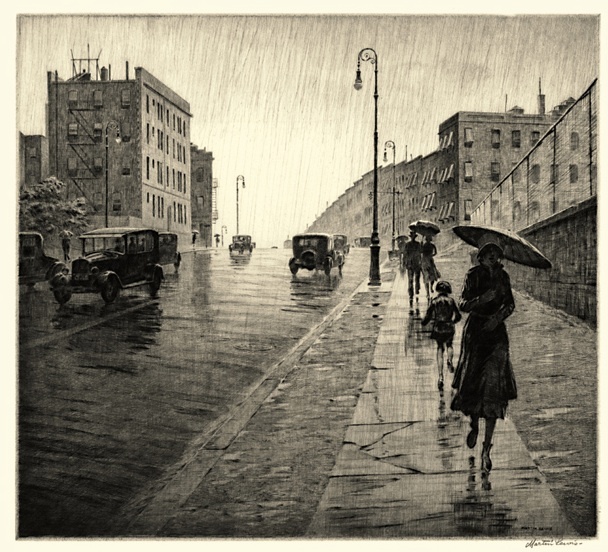 Martin Lewis’ drypoint print, “Rainy Day, Queens,” captures light behind cloudy skies and in slick sidewalk puddles on a grim city day. Does anyone have an idea where this is? It’s moody and enchanting—and it sold at Christie’s for $23,750! I hope it’s not sitting in a closet somewhere. This entry was posted on October 3, 2011 at 4:34 am and is filed under Music, art, theater, Queens, Transit. You can follow any responses to this entry through the RSS 2.0 feed. You can leave a response, or trackback from your own site. Ever since you started showing his paintings I’ve really grown to love his work. There’s a sense of isolation and apartness which shows the NY character. He or she is ever alone. I know exactly what you mean. 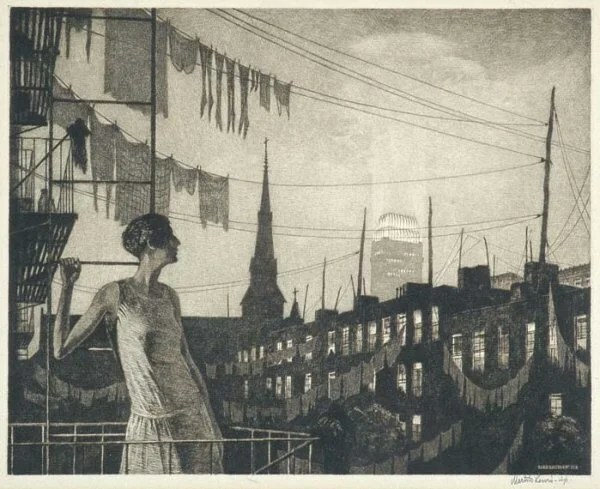 I came across Lewis only after I started Ephemeral, and over the past few years I’ve become a huge fan of his lovely and fascinating prints. Now if only I had 23K to buy one…. I don’t know where this is, but I think there are at least two big clues for others more familiar with Queens: the wall on the right with nothing behind it could be a railroad overpass and the fact that the road slopes dramatically down after that. Perhaps one of the LIRR overpasses, like Thompson Ave in LIC (though the buildings do not match). It could be one of the Sunnyside railroad overpasses — Honeywell Avenue or 39th Street, perhaps. Could it be Bell Boulevard in Bayside, where it crosses over the LIRR tracks and station below? Woodside, looking westward towards Sunnyside. Up the crumbling bluestone sidewalk on Skillman Ave., Roosevelt Ave is at your back. The crest of the hill is the point where 54th Street zig-zags across Skillman. At the time the work was made, it was a brand new neighborhood, carved out of overgrown farms and crumbling homesteads on the wastes lying west of Woodside. Check out NY Public Library’s Digital Gallery entry (Image ID: 725455F), showing the same direction from about a half block to the left. See also Image ID: 725454F, showing the sidewalk in the foreground of the print; photo taken from across the street, looking north. The fenced wall along the busted sidewalk is the perimeter of the old P.S. 11 property. See it at the gallery: Image ID: 728232F (but not from the perspective of Skillman). The foreground has been transformed, but all buildings in the print are still there. The first building on the left is the 4-story walk-up apartment building on SE corner of Skillman and 54th. I spent a good hour this morning combing the rail road overpasses in that area and through Queens this morning! There was a time when that sort of thing could have gotten you in hot water with the vice squad. I believe you are correct. I went onto Google Earth and looked at the window pattern of the large building–which is still extant at 54th St. and Skillman Ave.–on the left in the picture. It matches up with the one in Lewis’s print. Good work! It’s one of my favorites too. And hey, the starting bid is just $7,000!